New Method Man LP on crystal blue vinyl! Method Man is coming out from hiding to release a new mixtape/album, The Meth Lab, which'll be the rapper's first release since his collaborative project, Wu-Massacre, and his first solo effort since 2006's 4:21...The Day After. 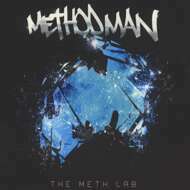 After unveiling the cover art for The Meth Lab at the beginning of the month, Method Man returns today with the complete tracklist. The project arrives on August 21st via Tommy Boy Entertainment. The tracklist isn't lacking, at 19-songs long, it features affiliates like Redman, Raekwon, Masta Killa, Mack Wilds and more.